If the bottom half of your figure is curvier than the top, it’s a good bet you’re rocking a perfect pear shape. There are a ton of fabulous polished professional options out there suited for you! Read on for more pear-perfect professional wear ideas. Flawless fit-and-flare and awesome A-line dresses (and skirts) are a pear-shaped gal’s best friends! They nip in at the middle while still leaving room to spare around the hips. Looking for the superstar of the dress scene? Throw on an iconic wrap dress for instant waist definition. All these styles come in perfectly professional fabrics, styles and patterns to keep you looking like a boss. Stylist tip: Dresses not fitting perfectly? Look for spandex-blends to help with size discrepancies between your upper and lower half. Wake up your work wardrobe with a fashion-forward style like culottes. Keep your look sleek in a flowy woven that hits just below your knees and won’t grab at your curves. Tried-and-true classics like bootcut trousers are another cut to consider, since they have a fit that skims the hips and thighs while balancing the look with a wider leg. Stylist Tip: Dark colors like olive and navy will ground your look and balance your bottom half. Beat the bulky blazer blues by opting for a knit piece that has both give and structure.Shoulder pads bring visions of 80’s power suits to mind, but the understated modern day version is actually a boon for a pear-shaped babe. They bring your shoulders in line with your hips to create a perfectly proportioned silhouette. Not sure where to start? 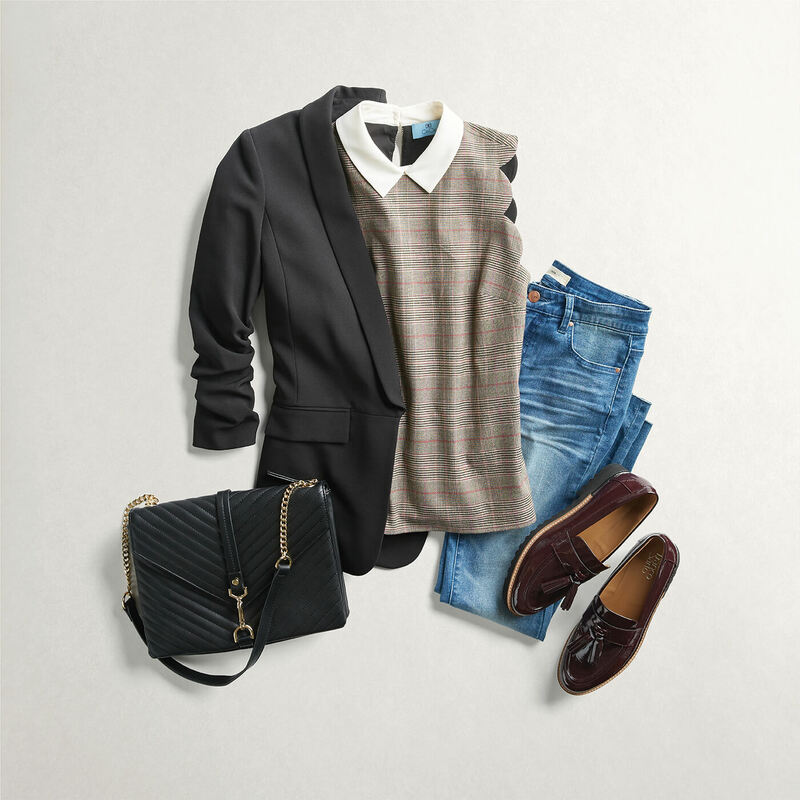 Try mixing and matching these pieces to create a polished professional wardrobe. Ready for new business casual staples? Schedule a Fix and let your Stylist know what you’re looking for!